We informed you about the Google Nexus One when it was rooted even before the official launch. And now with just under a week of release, Nexus One has been hacked already to enable both wireless and wired (via usb) tethering option in Android 2.1. Folks over at the XDA forums have released some add-ons, which needs to be flashed over the top of the existing Android 2.1 firmware to get it to work. This is not a full fledged ROM, but an add-ons pack which includes a custom kernel, Busybox, Nano 2.09, powertop, dropbear, wireless tethering option (Yay! ), titanium backup and more. Follow the steps below to install all these add-ons to enable tethering on the Nexus One. Note: Follow the step by step guide posted below on your own risk. Make sure you make a backup first using Nandroid. We are not to be held responsible if you end up bricking your beloved Google phone. Step 1: First up, you will have to unlock the bootloader, and then root your Nexus One for full file system access on Android 2.1. Follow the guide posted here to unlock the bootloader, and here to Root Nexus One if you haven’t already. Step 2: Now download the Nexus One Addon 0.1 from the source link and flash it over the existing firmware. Don’t wipe! 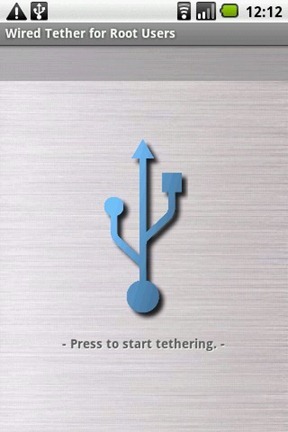 Step 3: Now simply install wireless tethering, VPNC client, Adfree, N1 Torch to your liking. If you want to enable wired tethering, you’ll need to download an app for that from either Android Market, or directly from here. With tethering now enabled, it wont be too long before hackers enable multitouch functionality on the Nexus One by either porting it over from Motorola Milestone ROM, or through the European version of Nexus One which is said to be having this functionality. Our complete coverage on the Google Nexus One phone can be found here. You can follow me on twitter or join our facebook fanpage to keep yourself updated on all the latest from Android phones. Very cool that this is available. Tethering will save you when your on the road and need to do real work on the web. Its saved me more than once. So I am thinking about picking a Droid and I am leaning toward the Nexus. I dont need a pull out keyboard, and i dont even want to spend the $30 / month for Data, I just like the Wifi deal. I am almost always in a location that has Wifi…..
so, am i nuts for looking at this phone for just phone and wifi? Is it overkill without purchasing the data ? Not overkill at all! This is a awesome phone, I just got mine on the last two months of my ATT iPhone contract and simply switched SIM cards. I purchased the TMobile version, so that means I can only use Edge on ATT until my contract is up and I can use 3G with Tmobile.